While it has taken a bit longer than expected, 4K is finally beginning to catch on, and it was only a matter of time before Apple caught up and set their own offering out into the world. 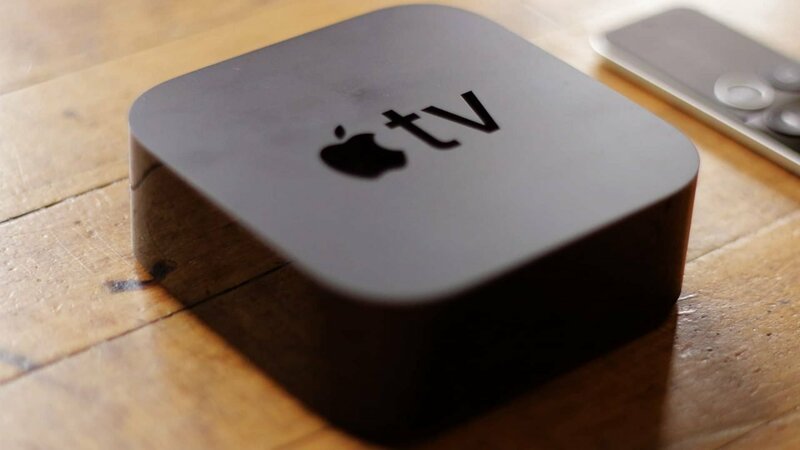 The Apple TV 4K was certainly expected before it was announced. With many competitors already in the 4K space, it was only a matter of time before Apple dipped its toes into the world of UHD, but the final result is a much more polished, refined experience than I was expecting—even if there are a few areas in which I feel Apple could improve. From the look of the device, the Apple TV 4K looks very similar to the 4th Generation offering. The small black curved cube is an overall attractive device. It fits in with the modern minimalist TV landscape. 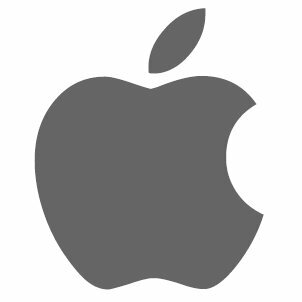 The unobtrusive Apple logo at the top and a small light on the front are the only noticeable markings you will see as it sits snug next to your TV or tucked into a media center. 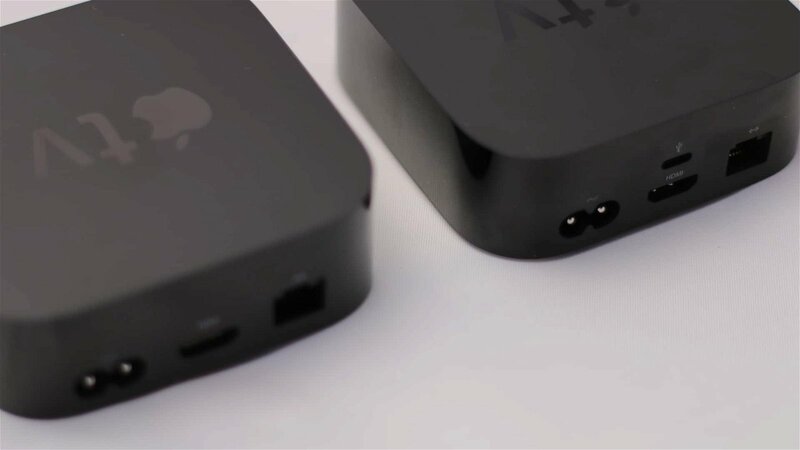 A quick look at the back of the device and you will find a Gigabit Ethernet port, a power port and a standard size HDMI connection. Removed is the lighting port that was found on the 4th Generation box. Looking to the bottom and you will find the vents to ensure the unit stays cool during intense operations and playback. The remote has not changed much from the previous iteration. 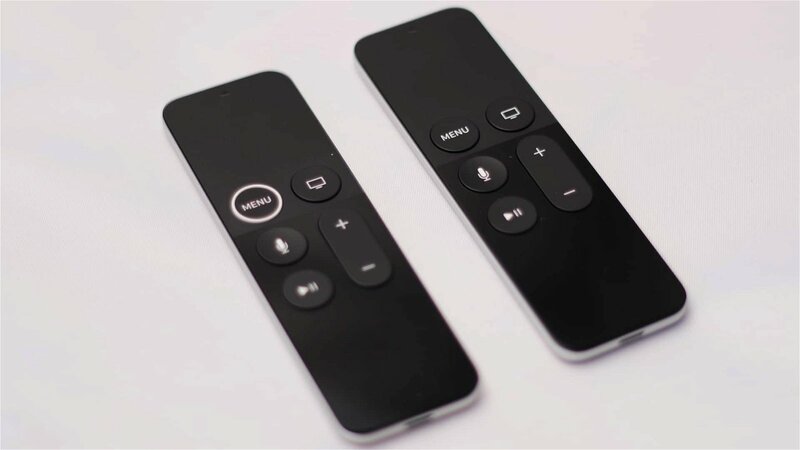 The top of the remote still acts as a touchpad mouse-type interface to your Apple TV. There is also a Menu Button that has an added ring to make it easier to find by touch, along with play, voice control, volume, and TV/Home buttons. It is one of the nicer remotes I have used, fitting easily in the hand with a solid, well-built feel to the full thing. To ensure you do not need to worry about batteries, the remote has lighting charging that will ensure it is always ready to go provided you charge it weekly. 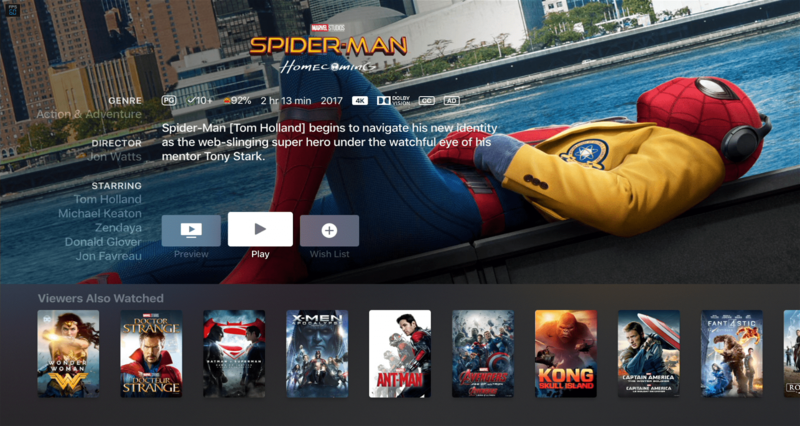 Moving on from the well-crafted exterior, Apple has done some good work to ensure the new Apple TV 4K will be up for the challenge of delivering 4K content—and even a selection of games. At the core of the device is the new A10X Fusion processor that should be more than powerful enough take on any content you can throw at it. While testing, I noticed no slowdown, hiccups, or lagging while playing content or games. It was a fantastically smooth experience. While everything sounds good on paper, the real question is how it performs in real-world testing and how it keeps up with the competition. To that note, I have to say that Apple tvOS is one of the most vibrant and exciting interfaces currently on the market. Everything looks clean, vibrant, and easy to understand. It has the unmistakable Apple flourishes, such as a 3D effect as you navigate the menus, and clean, crisp animations. That is not to say Roku or Android TV is bad in comparison, just less visually interesting. It all winds down to if you want the interface to step out of the way as you look for content, or be an ever-present part of the experience. The big selling points for the Apple TV 4K are the new support for—you guessed it—4K, along with HDR (High Dynamic Range). 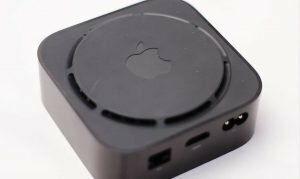 It is worth noting that Apple is a little late to the party on this front, as PlayStation 4 Pro, Xbox One S, Roku, and a selection of Android TV Boxes already offer these features and this is the first Apple TV that does so. 4K is an output that has taken a while to catch on. If you are unaware, it is the resolution of four times 1080p, giving a much sharper, and more clear image. In practice, however, if you have a TV less than 55 inches you won’t see much difference. It will be a bit clearer, but the true detail will be lost to all but the most discerning user. 4K HDR, on the other hand, is much more noticeable. It increases the contrast and brightness between all colours, allowing blues to look more natural and reds more vibrant. If you have a film that has taken this into account when being made, it can feel as major a leap as SD was to HD 1080p—it breathes new life into films. Apple wisely chose to support both major standards for HDR: HDR10 and Dolby Vision. But, in an odd choice, unlike most HDR compatible devices that turn HDR on for content when needed, the Apple TV 4K has HDR on all the time, even in non-HDR content. While from a usability standard it makes sense as it avoids flickering when the mode is enabled, in a practical sense it means some content actually can look worse on the Apple TV 4K compared to the Apple TV 4th Generation. It is hard to say if this will change in the future, and in reality, in most testing, it did not pose a major problem, but it is good to take note. While there is the promise of a world of 4K content, the sad truth is that at present there is only a small selection of content you can watch that will take advantage of your new Apple TV 4K. There is a solid selection of movies in the iTunes store, where there are over 100 titles currently available in 4K, although at the time of writing there were no TV shows in 4K that I could find. This stacks up well next to the competition, and in Canada this is your best source for 4K movies available for digital purchase. One of the biggest moves Apple has made with the Apple TV 4K is the announcement they will not be charging a premium for 4K content. It will cost the same as a standard HD movie, which means for $25 CDN you can purchase a movie for the enjoyment of your entire household. 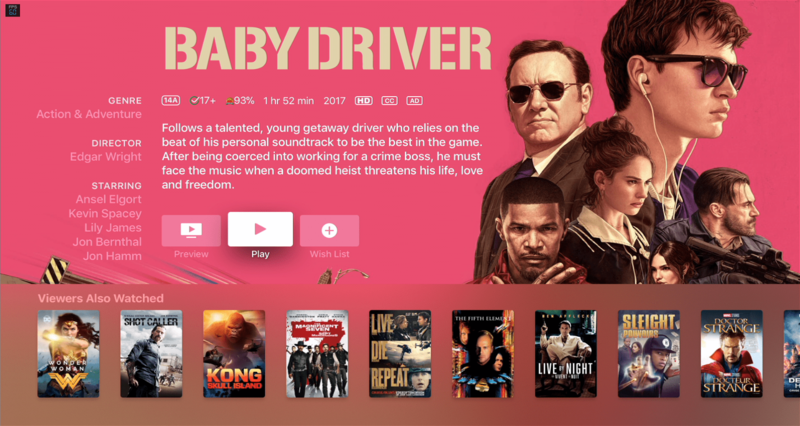 For testing, we tried a selection of 4K Netflix content, including Baby Driver and Spiderman: Homecoming from the iTunes store. With Baby Driver, the colours looked vibrant and the details jumped off the screen. If you have the TV that supports this level of HDR and detail, this is the best way to watch the movie beyond seeing it in the theatre. While watching I noticed no slowdown, hiccups, or major artefact issues. The movie started playing in vibrant 4K without any real issue. Spiderman: Homecoming was also a pleasant ordeal. Dark scenes had the contrast to ensure everything was visible, colours never felt muddy, and the detail was crisp and clear throughout the film. It should be noted that this was all done via a cable Ethernet connection at 100mbs. With Wifi, there was a noticeable difference in startup speed, and although there were no real issues once the movie started, it did take a bit longer to show the 4K content. This is the simple limitation of Wifi, and although it was not a major problem, if you have the option, due to the bandwidth needed, a physical connection is always ideal. With apps like Netflix, the content was much clearer than the 1080p offering, although it was not noticeably better than other 4K steaming boxes. The content looked vibrant, and the HDR worked wonders making content like Daredevil or House of Cards look fantastic. There were more artefacts noticed on the Netflix content when compared to the iTunes offerings, but that is to be expected. The audio was also a pleasant surprise. Sound through my receiver was as one would hope on a modern offering, although it should be noted you will need to ensure you have HDMI 2.0a for the HDR and audio to work as intended. That being said, most receivers built in the last year should have this feature but if you are not sure, it would be worthwhile to ensure it does before purchasing, or you could be in for the disappointment. At this time the Apple TV 4K does not currently support Dolby Atmos. This is an odd omission since Xbox One S and many Roku boxes already support it and have for a while now. While this only affects a selection of the audience, for such a high-end streaming device, this sort of omission is truly head-scratching. The Apple TV 4K starts at $179.99 USD for the 32GB model, with the 64GB model costing $199 USD. 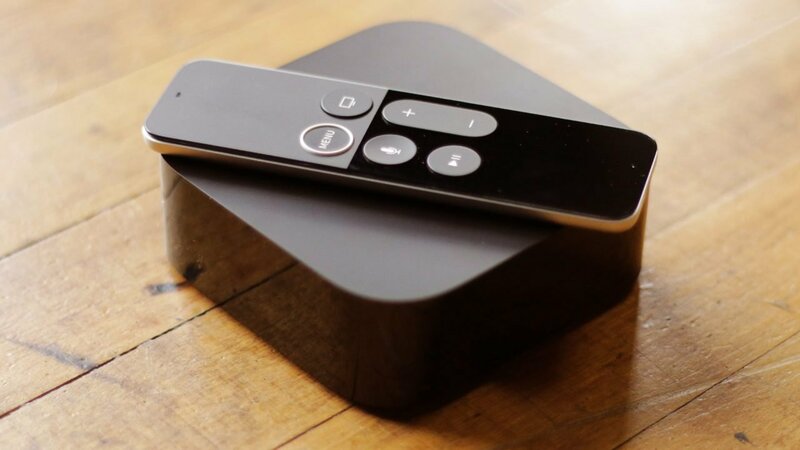 When compared to the Roku Ultra that costs around $100 that also allows 4K streaming or around $199 USD for the NVidia Shield, the Apple TV 4K sits somewhere in the middle, making it an enticing choice, especially with the iTunes library at your disposal. Apple may have come late to the 4K party, but their offering is something that they can be proud of. While there are a few odd choices such as always on HDR, the overall product is a great streaming box that stands as one of the top options for 4K content and if you already are deep within the Apple ecosystem it is a no-brainer. That being said, if you don’t need 4K, the 4th Generation Apple TV remains the best choice. Liked this article and want to read more like it? Check out more stories from Brendan Frye, such as the Future of Xbox One – an interview with Xbox Head of Operations, Dave McCarthy, and his interview with Destiny 2 Art Director, Jesse Van Dyke! 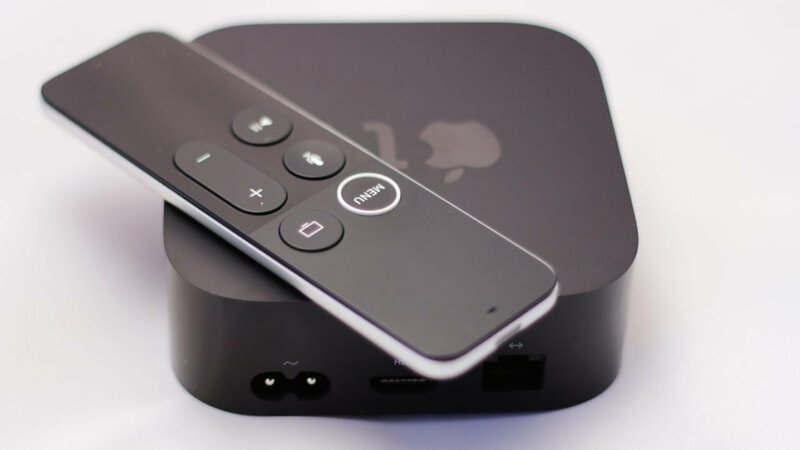 Apple enters the 4K future with the Apple TV 4K, while it is not the best box on the market, the iTunes store make it a hard 4K device to resist.